Hold the chip clip! While shopping at Whole Foods the other day, I happened across a display for Pop Chips and thought I’d give them a whirl. I was pleasantly surprised by the light and crisp flavor. 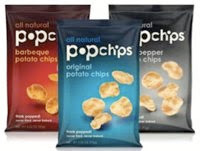 I really like the philosophy behind Pop Chips too - they’re popped, not fried, and not baked. A visit to their website didn’t really reveal how popping occurs, but suffice it to say, these guys have got it going on when it comes to providing a delicious and nutritious snack that is all flavor, no gunk. Still, I’m curious as to how that process works, which, per their website, is said to be a process of heat, pressure, and “magic”. The Pop Chips that I tried were the Sour Cream and Onion variety, and I must say, these were superbly good, and a big part of that is likely due to the fact that I didn’t have to feel guilty for eating them. There are no trans-fats, preservatives or artificial flavoring in these fabulous chips. And for those of you who love salt and vinegar chips, I noticed that their Sea Salt and Vinegar variety had no more sodium than the other flavors, so that’s a big plus. Other flavors include Original, Barbecue, Cheddar, Salt and Pepper, and Parmesan Garlic. So here’s the skinny on Pop Chips. Each one ounce serving of about 20 chips has just 120 cholesterol free calories and 3 weight watchers points plus points. You can find these at a ton of different retailers, including Target, Safeway, Whole Foods, and online at Amazon. I can't deny that I love crunchy low calorie snacks. If you feel the same, you should also check on my posts on Kettle chips and Kay's chips, and my recipe for low calorie pita chips, among others. could you post how much you buy your products for, please? i would like to buy products like this however i always find them to be too expensive. it would be of a great help if i (we) could see how much you're spending! What a great find! Makes me curious how they "pop" them, but as long as they're not fried that's excellent. I also love Kettle chips, really good and healthy, it's the way to go!